I broke my left distal fibula and my 3rd metatarsal on Sept 12, 2009. 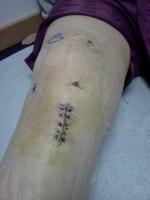 I then had surgery on October 2. Had to wait so long due to swelling and doctors schedule. I had 6 screws and a plate. I was in a partial plaster splint until October 15 and was then given a walking boot to wear however was told not to bear any weight for 7 weeks. I just started physical therapy on November 9. I believe that I get to start walking with my boot and possibly one crutch this week. I am finding it very frustrating that my doctor is very busy and doesn't spend any time explaining anything to me and will not give me any idea of how long my recovery will be. I had a couple of questions that I was hoping you may be able to help me with. I have noticed that when let my leg hang down after having it elevated my foot turns a shade of purple/blue, but once I elevate it again my foot turns back to its normal color. Is this normal? I also have noticed now that since the swelling has gone down that the ankle bone that sticks out on the outside of my leg seems to have a type of bump on top of it. Is this a screw or part of the plate? When I went to my last ortho appt on November 5 I was told that I would get to walk in 2 weeks and to just "go" ahead and walk. Am I going to be in a lot of pain when I walk? And my last question is how long will I have to wear the walking boot for? My next ortho appt is not until Dec 7. My physical therapist has no clue about why my foot may be turning the color that it is and can't really answer any of my questions/concerns. Sorry to overload you with questions I am just getting very antsy to get back to normal since it has already been 2 months since I last walked. I hope you can help.